Light that enters the eye can be divided in two parts. The largest part is refracted by the optical media (cornea and crystalline lens) to project an image of the outside world on the retina. This makes us able to see the world around us. Some part, however, is scattered in all directions by imperfections in the optical media, creating a veil of light over the retina that reduces the contrast of the retinal image. This part is called retinal straylight. 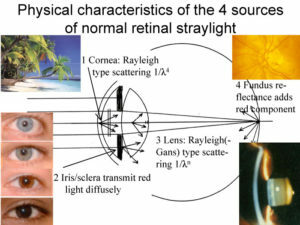 This figure illustrates the physical characteristics of the four major sources of straylight in the normal human eye. Corneal light scatter is more or less constant with age, but may increase as an unwanted side effect of refractive surgery. The iris and sclera are not completely opaque. Depending on the level of pigmentation, some of the light is transmitted. Light scattering by the crystalline lens increases with age, especially when cataract develops. The fundus does not absorb all the light, causing part of the light to be reflected backwards and to scatter to different locations on the retina. This figure illustrates how most people subjectively perceive straylight. It is the result of physical computations of the pattern projected on the retina by the process of light scattering from small particles in the optical media of the eye. 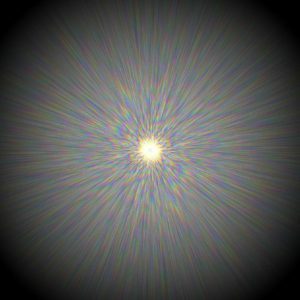 For the computation results were used on our studies to characterize the light scattering particles in human eye lenses. Movie 1 shows the interference pattern on the retina originating from 1000 light scattering particles in the crystalline lens as function of wavelength (indicated in the upper right corner). However, if a white light source is observed (e.g. a halogen lamp), all wavelengths are simultaneously present. The effect of combining all wavelengths is shown in Movie 2, starting with deep red light, and adding more and more of the visual spectrum. Watch the movies in full screen mode to see the effects.